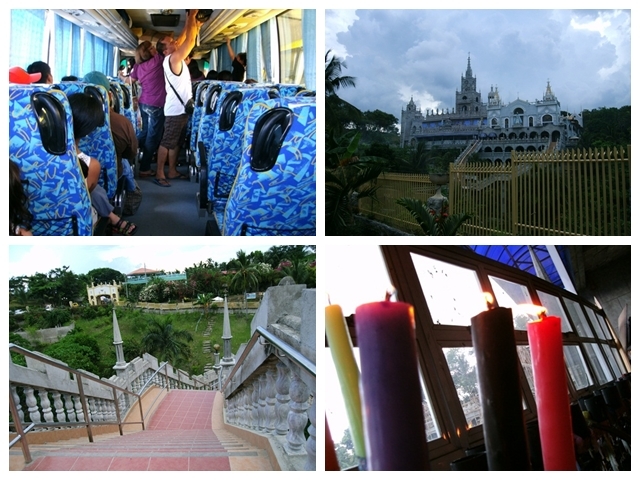 The Miraculous Virgin Mary and the palace like Church in Simala... what's in it that makes people hunt for miracles? The miracle stories that I heard from people and devotees makes me want to go and thought of hunting for that un-explainable feeling that they say you'd feel when you get there. I do pay respect to Mama Mary, and to Jesus who saved the whole world from sins. I respect the experiences that other people may have experienced in this place. The million stories and proofs displayed inside where overwhelming. The Church was so huge that somehow looks (for me) odd. I feel like being looked at by Zeus or the other Greek Gods. The huge structure makes me feel that something is isn't right. I mean that's how I felt. But despite that feeling, I went in to the church trying to find that peace, a minute or an hour of silence and call for forgiveness from within. The church looks luxurious to me. The interior is really nice. It's quiet and many other people going back and forth, some were trying to take pictures, others where whole heartedly praying and the rest were like tourists. In my next visit, I may have to go there during the busy days where there's a scheduled mass, coz I might get that feeling they had when they were here too. I might have not met my expectations because there was no mass schedule when I arrived, no people lining up to meet the miraculuos Mary, no devotees that would probably fill the whole place with prayers and probably because it's almost closing time. Somehow I thought, Could it be because I have that feeling of finding peace in the wrong place or for a wrong reason? 1. Go to the Cebu South Bus Terminal. Assuming you are from SM Cebu ride 1K and jump off E-MALL. Walk few meters to the right from E-MALL and you'll see South Bus Terminal. 2. Look for the Bus going to Simala. Pay a 5.00 pesos terminal fee. And wait at the designated waiting area for the Bus passing Simala. - We took the Bus going to BATO.